Stand for Bradley Manning this Saturday at Fort Meade! Thread: Stand for Bradley Manning this Saturday at Fort Meade! After seven years [twice as long as any other whistleblower ever], Manning is expected to be released today. She will go into some weeks of seclusion and then move to Maryland and perhaps then speak publicly. Under the current climate in the country, I would think her safety is also a big concern. Chelsea Manning will be released from Ft. Leavenworth prison today after her 35-year, maximum-security sentence was commuted by President Barack Obama before he left office in January. In 2010, Private Manning, then known as Bradley, leaked over 700,000 documents to Wikileaks, including classified diplomatic cables, Army reports, and videos while stationed in Iraq as an Army intelligence analyst. The Manning disclosures are one of the largest classified document leaks in US history, in league with the Edward Snowden disclosures and Daniel Ellsberg’s Pentagon Papers. Some credit the Manning leak as an important catalyst for the Arab Spring. Wikileaks released many of the documents in an unredacted form to the Internet, gaining both condemnation and praise for the organization and its founder, Julian Assange. The Manning leaks put Wikileaks in the mainstream consciousness, where it continues to remain. The most sensational documents revealed wrongdoing by the US government, and its attempts to cover them up. For instance, documents show that the US was well aware of torture and prisoner abuse perpetrated by Iraqi Security Forces, and did nothing about it. Another revelation was that known Egyptian torturers had received training at FBI headquarters in Quantico, VA.
Other documents showed the inner workings and deliberations of an American empire in the process of pushing its own policy agenda and geopolitical strategy forward, often at the expense of others. Political scientists and historians consider the documents a treasure trove, a window into the machinations of American foreign policy. Manning was arrested after revealing what she did to an online acquaintance, who then alerted the authorities. She was tried and convicted under the Espionage Act. Immediately after sentencing, Manning released a statement through her lawyer revealing that “I am a female,” and that she wished to undergo hormone therapy, procedures which are not available at Ft. Leavenworth. During her detention, Manning attempted suicide several times, leading her to be placed in solitary confinement. As the Obama presidency came to a close, many activists made a concerted effort to appeal to the president to grant Manning clemency. Among them was Edward Snowden, who leaked a large cache of intelligence documents revealing massive US & UK government surveillance in 2013, and who himself sought a presidential pardon. 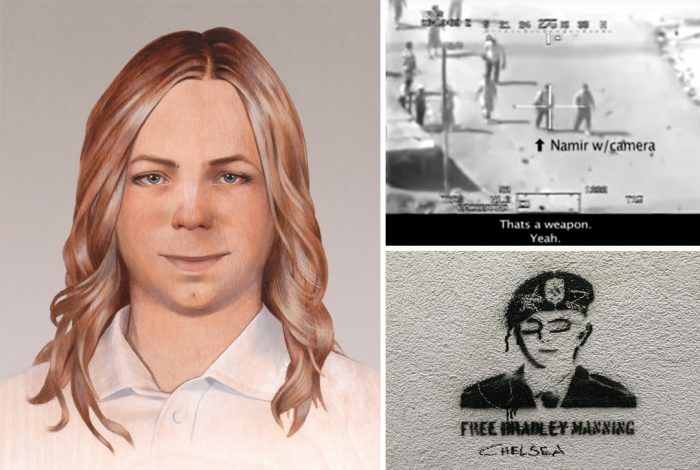 Mr. President, if you grant only one act of clemency as you exit the White House, please: free Chelsea Manning. You alone can save her life. Manning and Snowden’s methodology for leaking the documents they came to possess stand in contrast, and have been a source of some criticism against Wikileaks. Snowden chose to leak his cache to a group of journalists, who carefully reviewed and curated each document, making sure to redact names and any sensitive information they discerned was not in the interest of the public. The journalists then shared the information they were about to publish with the government to make sure they were not putting any lives at risk. Manning, in contrast, leaked his documents to Wikileaks, which released many of the files in an unredacted form. The Manning leak has had a profound effect on people’s perspective of the Iraq and Afghan wars. And, like the Snowden leaks, it has challenged Americans to examine the issues of transparency and secrecy, calling them to question what the government does in their name; especially when it sheds blood. The below leaked video from Manning is of two AH-64 Apache helicopter gunships killing a group of Iraqi men, some of whom may have been carrying AK-47s and RPGs, on July 12, 2007 in Baghdad. Two of the men were Iraqi war correspondents carrying cameras. No charges were ever brought against any US military personnel. Update 5/17/2017, 10:55pm EST: This story has been corrected to reflect that not all of the leaked documents from Manning were published unredacted. I wonder if there is any future for her in the US? I know she has UK citizenship as well. Maybe Irish as well. Maybe she could start a new life there. Not that life will ever be normal any where. She has many friends and so much to be proud of and can rest assured that she has contributed in the greatest possible way to the world. But there are also enemies and bigots to be aware of. Her family is in Maryland, so she is heading there [likely there already]. She is going to keep a VERY low profile and not live in known past locations, plus have guards. I think some intelligence agencies and loners would like to kill her in the USA, but she'd not be safe anywhere - but more safe in a small place out of the USA, for sure.